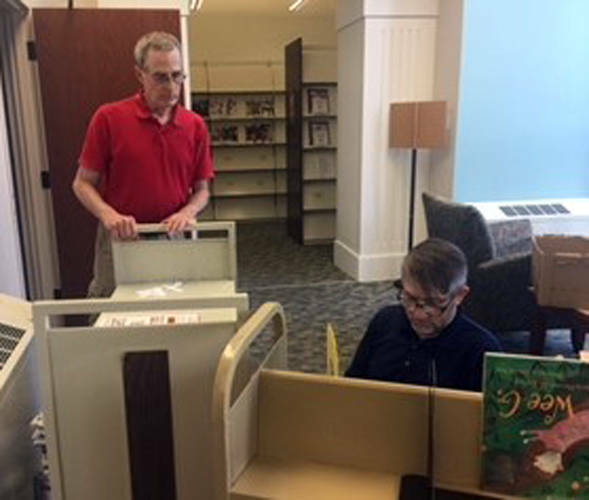 Treasurer Craig Stickel and Co-President Steve Shaw sort books for sale for the Friends of the Greenville Library. GREENVILLE – The officers of the Friends of the Greenville Library thanked all its members for their support. As of the end of June, the Friends of the Greenville Library have 35 single members, 58 family members and 14 corporate members. Its members also provide the goodies for the Holiday Open House the second Saturday in December. The FOL currently supports Author’s Nights, the summer Family Fun Days and the 1,000 Books Before Kindergarten program. It also purchases items the library is not budgeted for. The Friends of the Greenville Library appreciates all the book donations the public gives it to sell. The group generally gets very nice books, but sometimes people clean out their attics or basements, and the books are in bad condition. If they can’t be sold, the FOL asks individuals to consign them to the rubbish bin or recycling. Some of these items have mold and animal droppings. They are a health hazard to everyone. Those who wish to join the FOL, signup forms are in the library. A single yearly membership is $5, family is $10 and corporate is $100.